The final day of the Paris Grand Chess Tour brought all the drama and excitement that one could have hoped for. World Champion Magnus Carlsen started and finished the day ahead of the field, but the final standings can’t do justice to the roller coaster ride that was today. 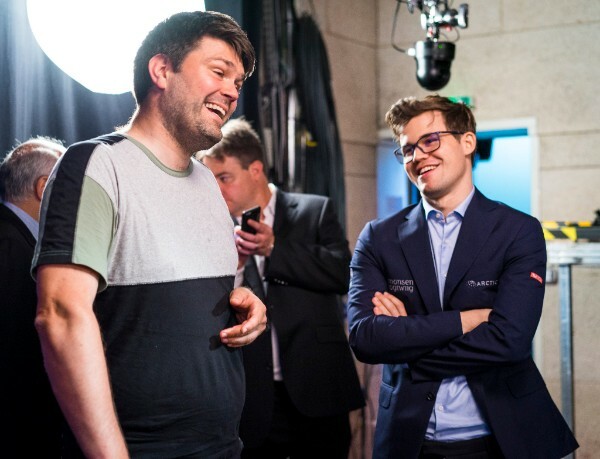 French chess fans were in for a treat as they watched the local hero, Parisian Maxime Vachier-Lagrave, rip through the field to join Carlsen in the playoffs. 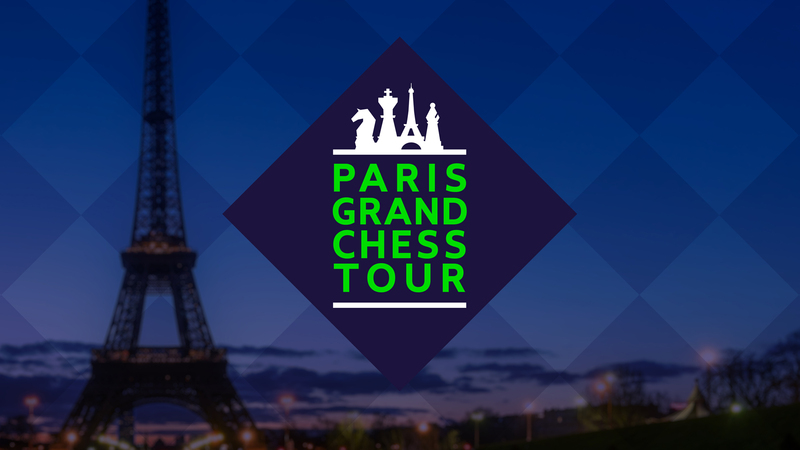 Unfortunately, the Frenchman came up short but he is still in a good position in the tour and has proved himself to be a remarkable blitz player. 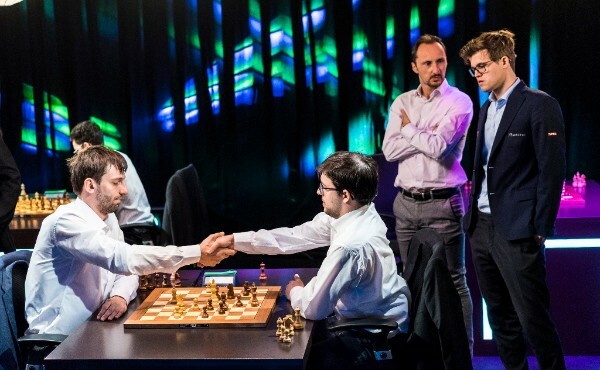 The next stop will be Your Next Move in Leuven, Belgium starting June 28 where Carlsen, Vachier-Lagrave, and So will be joined by Levon Aronian, Viswanathan Anand, Ian Nepomniachtchi, Vladimir Kramnik, Anish Giri, Vassily Ivanchuk and Baadur Jobava. Maxime Vachier-Lagrave saw Carlsen’s poor performance as an opportunity to pounce and surpassed him after round seventeen. Had he won his final round game against Grischuk, he would have won the event outright. Vachier-Lagrave scored an impressive result of 7/9 without any losses, which was only enough to tie for first with Carlsen. 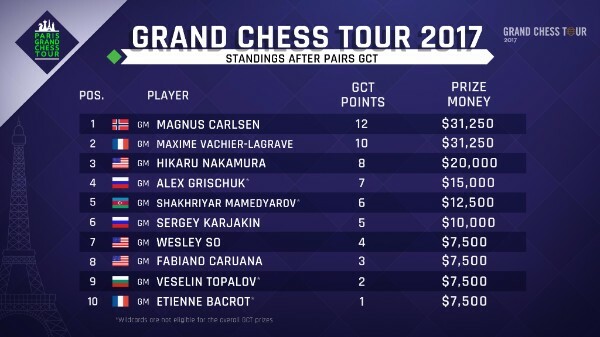 Vachier-Lagrave and Carlsen met in the playoffs to determine who will get the 12 Grand Chess Tour points. The format of the playoffs was two games of 10 minutes each with a 5 second delay. If that also ended in a tie, the next stage was a 5 minute game with a 3 second delay followed by Armageddon in case that also ended in a tie. The playoff was a quick one as Carlsen showed off his endgame skills by taking advantage of his opponent’s weaknesses and converting his extra pawn. In the second, he had the black pieces but all the pressure was on his opponent to win the game. Carlsen had the better position but decided to repeat the position and take the draw, winning the event. The third place finisher was Hikaru Nakamura, who kept pace with Magnus and Vachier-Lagrave for most of the event. His decision in round 16 to under promote to a knight instead of promoting to a queen and forcing a draw cost him the tournament. He came back in the very next round to beat Carlsen, but he was already out of the contention for first place. Alexander Grischuk and Shakhriyar Mamedyarov started the day in third and fifth place respectively and finished in fourth and fifth. Grischuk started the day strong but was unable to keep up with Vachier-Lagrave’s phenomenal performance. Since both players are wildcards, they are unable to compete for overall Grand Chess Tour standings. The other notable performance of the tournament was Fabiano Caruana’s strong showing in the blitz. After having the worst performance of his life with 1.5/9 in the rapid, he scored an impressive 11/18, which would have put in contention had he found his form in the first half of the tournament.